The Groundsman Turf Multi Cutters are renowned for their Smooth effortless cutting ability, ease of use and operating comfort, this becomes obvious within the first few feet of operation. A range of interchangeable Sod Cutting Blades from 30cm (12”) to 60cm (24”) wide are adjustable down to 7cm (3”) deep as well as blades for Mole Draining, De-compacting, Trenching and Cable and Pipe insertion. Two wheel drive model TMC26 is simple to operate and portable making it ideal for Landscapers and Hire outlets. The precision cutting of the rear blade four wheel drive model TMC46 make it the choice of Golf Clubs and Turf Farms. GROUNDSMAN offer a range of Pedestrian and Tractor mounting Turf Aerators from 45cm (18in) to 180cm (6ft) working widths. The model 345HD is a compact professional pedestrian machine that can access most garden gates and aerate all type of grass surfaces including Gardens, Parklands, Fine Lawns as well as Sports Greens. For larger areas the Tractor Mounting models are available for tractors from 18HP. This range have a long proven record of rugged reliability, performance and versatility. The crank driven elliptical plunge action mechanism drives the tines into the most compacted of surfaces down to 15cm (6in) deep with very little surface disruption. Quick change Hollow Core, Solid and Slitting Tines are available plus Cluster Tine Heads for thatch removal or surface preparation for over-seeding. 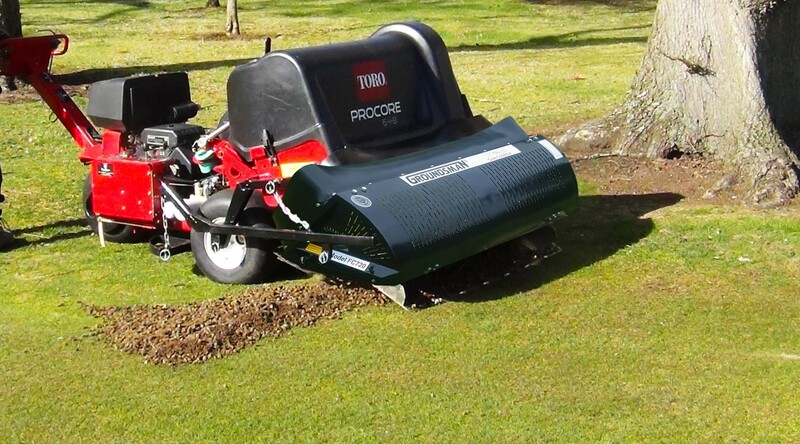 Groundsman’s FLEXBLADE Core Collector Attaches to any Aerator pedestrian or tractor mounted with swath widths from 60cm (24”) up to 210cm (83”) to CORE and COLLECT in one pass. 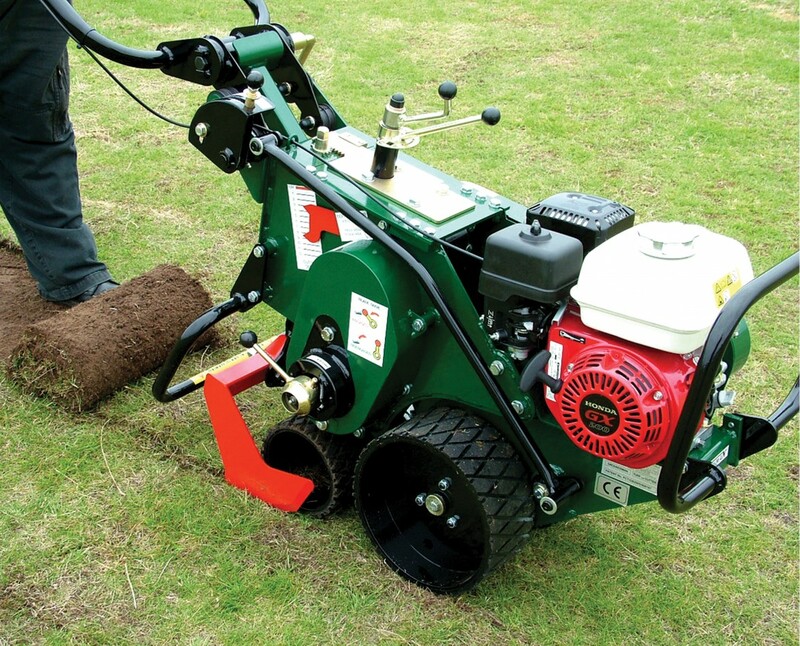 Available also for Compact Tractors & Turf Vehicles for Follow-up Collection of Cores and Linear Aeration Soil. 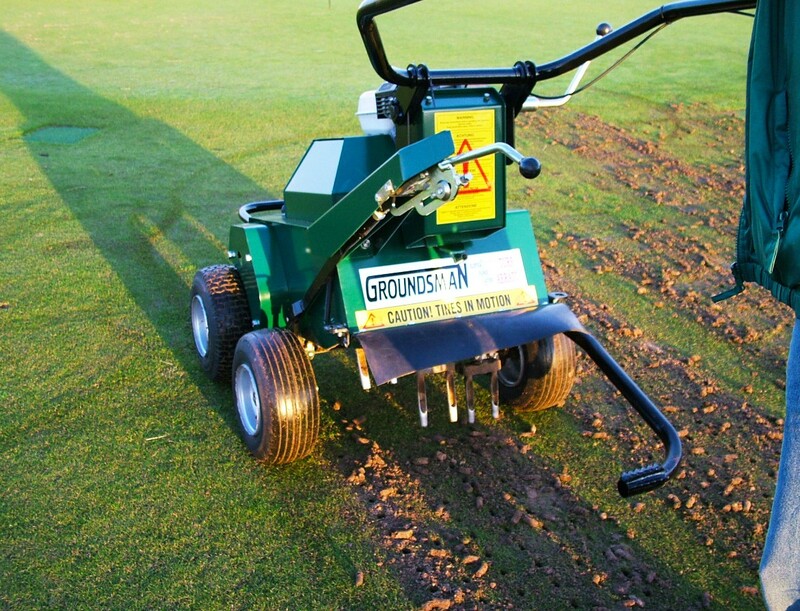 The patented FLEXBLADE Core Collector System developed by Groundsman Industries is the most efficient method of collecting cores wet or dry with minimum disruption. When attached to an aerator, more than half are caught before they touch the ground, the remainder are scooped cleanly from the surface by the FLEXBLADE that follows undulations like shovels for the cleanest possible collection.